This disadvantage starts early in women’s careers. Analysis of the data from just under 3,000 young workers in 32 countries who were interviewed as part of our Getting to Equal 2018 study revealed that by the age of 30, women earn 6 percent less than their male peers. 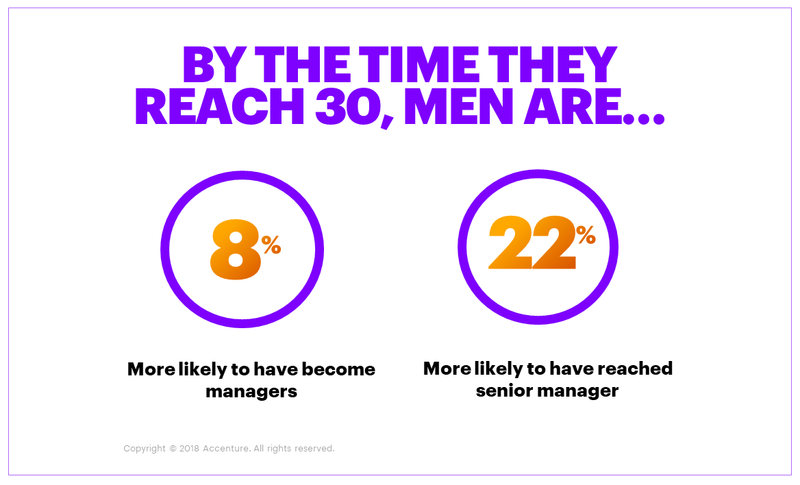 Young men are also 8 percent more likely to reach manager positions in the first five years of work and 22 percent more likely to reach senior manager levels. In our 2017 study on advancement and the gender pay gap2 we identified three powerful accelerators that help men and women to advance: digital skills, having a career strategy and developing technology experience. Even as students, young men have the edge, taking advantage of more of these accelerators during their years of study. Forty-one percent of undergraduate men upskilled in digital technology compared with only a third of their female peers. As graduates enter the workforce these disadvantages are perpetuated; 56 percent of men have a mentor at the start of their working life versus 50 percent of women. Bold leaders who publish targets for achieving diversity, make their leadership teams accountable and bring women into senior positions. Policies that solve for equality by focusing on creating a level playing field rather than just targeting things as a women’s issue. Encouraging women to take maternity leave, for example, decreases the likelihood of women advancing; unless you also encourage men to take leave too. Empowered and trusted employees who can use technology to give them flexibility over where and when they work and learn and who can be themselves at work; not have to conform or change their appearance. Companies are also changing the career outcomes of their young women workers and building a more diverse leadership pipeline. 1 All figures from Getting to Equal 2018, “When She Rises, We All Rise”. 2 Getting to Equal 2017, “Closing The Gender Pay Gap”.